Riggers work with a range of departments, such as SFX or stunts, across film, TV and commercial productions. They will work with these departments to design the rigging per the production’s requirements. This often requires creating bespoke structures depending upon lighting plans and other requirements. Riggers manufacture and disassemble essential access and bolster platforms, for example, as well as scaffold towers, cantilever frameworks, and asphalt and rooftop platforms. They position and remove specific gear for getting to the rig, for example, vertical steps, roof ladders, and rope ladders. Although this role is not glamorous, it is one of the most important. Riggers need to be able to asses the stress limits that the ceiling can take, and how to distribute the weight of the rigging. Without taking these measures, the rigging could end up on the floor, rather than the ceiling. As such, the Chief Rigger is responsible for ensuring the safety of everyone on set and all the riggers who assist with the setup. Riggers need an accredited qualification, such as the Advanced Rigging/Scaffolding qualifications in JIGS or NVQs/ SVQs, followed by at least two or three years with a good scaffolding company to gain valuable experience and training. There is no specific degree required to get into this role however knowledge in architecture, production design, mechanics, lighting, and engineering are helpful. If you are looking to gain qualifications, you could check out MetFilm school who offer a range of qualifications depending on the area you are looking to get into. Further, you will be on the road a lot of the time, so you need to ensure that you have a full UK/EU driving license. As a Rigger, you will be under a lot of stress as it requires excellent attention to detail and numerous responsibilities due to its ‘high risk’ nature. This is in large part due to the endangerment it can bring to your safety and well-being if your harness is not correctly fitted or equipment you have set up is not safe. You are also in charge of the cast and crew, so you need to be competent in making the set a safe environment. Conducting regular risk assessments will be beneficial to your output. You will also be reporting to, and receive instruction from a Chargehand, Supervising or HOD Riggers. 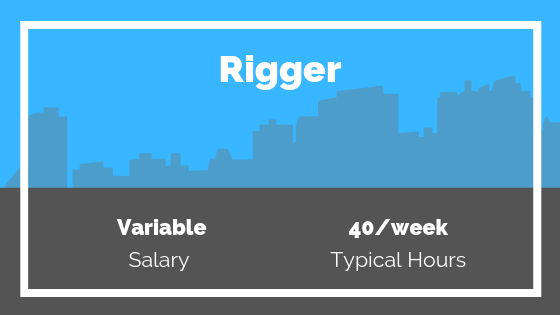 Depending on the experience level and location the rates of a Rigger vary. According to BECTU, an Advanced Rigger may earn up to £400 for a ten hour day, a Master Rigger (supervisor) will earn £500 for a ten hour day, and a Wire Supervisor will earn £668 for a ten hour day. The role is physically demanding, and you need stamina and good coordination, and must be comfortable working at heights. You should also be prepared to work long and often anti-social hours. This role is perfect for adrenalin junkies. If you are ready for the next step in your career, why not take a look at the latest Rigger vacancies on our jobs board? You can view our latest vacancies here.